never brush your pets teeth again! Description: Finally, pet home dental care made easy! Just add 1 capful of Pet Oral Hygiene Solution into your pet’s water bowl each day to fight plaque, promote healthy gums, and freshen your pet’s breath. No tooth brushing needed! Description: Best ear cleaner on the planetCleaning your pet's ears is no longer a chore, thanks to Oxyfresh Pet Ear Cleaner. Alcohol-free with no harsh chemicals, Oxyfresh Pet Ear Cleaner won't sting or burn your pet's sensitive ears like store brands can. And no residue is left behind to cause irritation. Dogs and cats explore the world with their mouths. And their adventurous spirits can often lead to tooth injury, bleeding gums and stinky breath. This is a soothing blend of Oxygene® and Aloe vera ... and it's our most versatile oral pet care product. Simply rub on your pet's gum line to help heal and soothe irritations and get rid of bad breath. Use as a pet toothpaste or apply to open wounds and abrasions for speedy healing power. ​Don't let bad pet odors take over your breathing space. 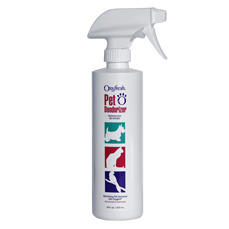 Spray Oxyfresh Pet Deodorizer anywhere pet odors are a problem ... carpets, bedding, litter boxes, curtains or crates. 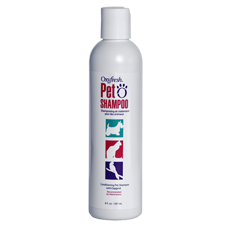 Oxyfresh Pet shampoo is paws down the best shampoo for dogs and cats. Its pH balanced pet shampoo has only safe, gentle ingredients to give your pet a shiny, fresh-smelling, and beautifully conditioned coat.